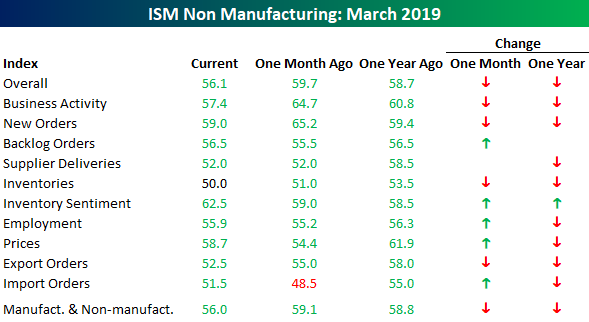 After a number of global PMIs for the services sector came in better than expected overnight and this morning, the ISM Services (non-manufacturing) report for March disappointed, coming in at a level of 56.1 compared to expectations for a reading of 57.9 and last month’s reading of 59.7. Not only was this month’s report weaker than expected, but it was also the lowest reading since July 2017. 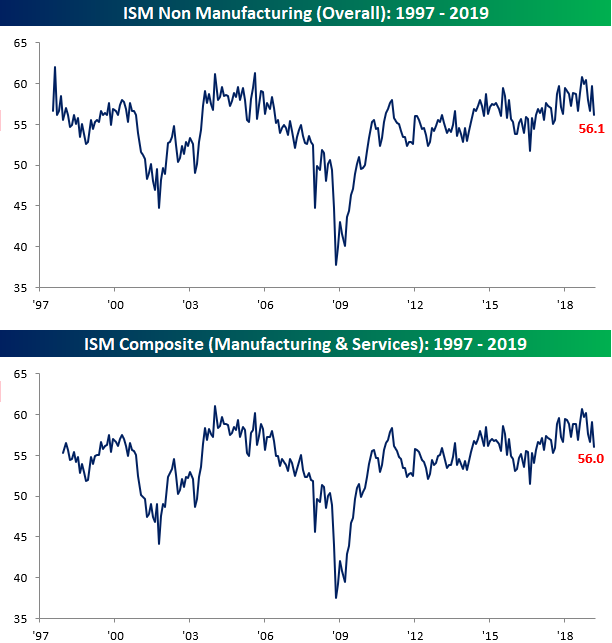 On a combined basis and accounting for each sector’s share of the total economy, the ISM for March came in at 56.0 versus last month’s reading of 59.1. This combined reading was the lowest print seen since August 2017. Start a two-week free trial to Bespoke Premium to access our interactive research portal. You won’t be disappointed! The table below breaks down this month’s report by each of its subcomponents and shows their m/m and y/y changes. Despite the large drop on a m/m basis, more components actually saw increases (5) in March versus declines (4). The biggest gainer was Prices Paid, followed by Inventory Sentiment and Import Orders. On the downside, the declines were larger and the biggest ones were Business Activity and New Orders. On a y/y basis, breadth was considerably weaker as Inventory Sentiment was the only component that increased. There has been a lot of inconsistency in economic data lately and one of the prime examples has been in the Retail Sales data from the last three months. Retail Sales isn’t the only example, though. Take a look at the chart of Business Activity below. In last month’s report, Business Activity rose to 64.7, which was the highest reading since August 2005. This month, however, the index for Business Activity dropped to 57.4, which was the lowest level since July 2017. In other words, Business Activity went from a 13+ year high to a 52-week low in the span of a month!